My husband has been begging me to make rugelach for years now. They are the favorite cookie of his youth and he has always raved about his mother’s rendition of them. I’ve just never gotten around to making rugelach happen. About five years ago, my husband attempted to make his own batch of rugelach. Oh my goodness, they were these horrible little petrified pieces of doodoo. They were so hard and burnt they exploded when you took a bite. Of course I laughed and didn’t think about making them for a long time. The dough is amazingly easy to work with and these were a cinch to put together. Of course my husband was the deciding vote, he said they were better than any his mother ever made. Wow! So folks, this recipe is a keeper and the pastry is just perfection. In the bowl of a stand mixer, blend butter, cream cheese and flour. Divide dough into three balls, wrap in plastic wrap and refrigerate 3 to 4 hours or overnight. 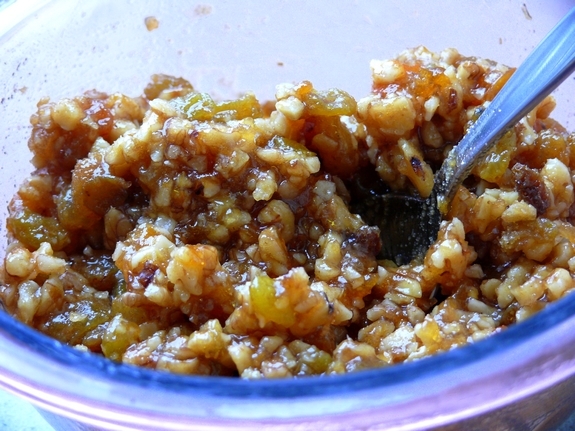 In a medium bowl, stir together preserves, nuts, raisins and brown sugar. Refrigerate for a few hours, or overnight. 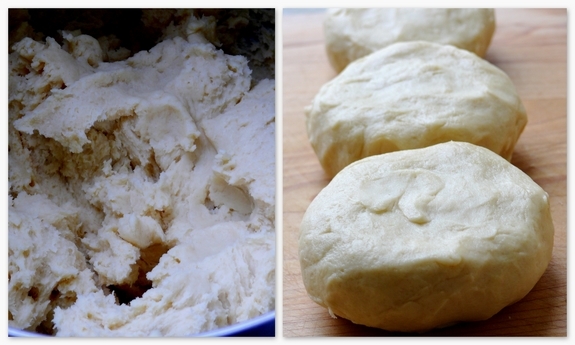 Remove the dough from the refrigerator and allow to sit on counter for about 15 minutes. On lightly floured surface or silicone mat, roll one ball of dough into a 12-inch circle. Using a pizza cutter, cut circle into 16 wedges. Place 1 teaspoonful of filling across wide end of each wedge. Starting at wide end, roll toward the point. Place cookies point side down on ungreased cookie sheet lined with parchment or a silicone baking mat. Brush with melted butter and sprinkle generously with cinnamon sugar mixture. Repeat with remaining two dough balls and filling. Bake 20-22 minutes. When cool enough to handle cookies, remove from cookie sheet, dip bottoms in granulated sugar and place on wax paper to cool completely. To make filling: In a medium bowl, stir together preserves, nuts, raisins and brown sugar. Refrigerate for a few hours, or overnight. To make dough: In the bowl of a stand mixer, blend butter, cream cheese and flour. (You also can mix the dough by hand.) Divide dough into three balls, wrap in plastic wrap and refrigerate 3 to 4 hours or overnight. To make topping: Meanwhile, in a small bowl, combine sugar and cinnamon and set aside. 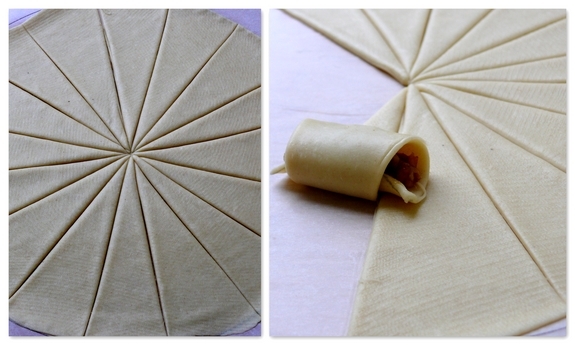 On lightly floured surface or silicone mat, roll one ball of dough into a 12-inch circle. Using a pizza cutter, cut circle into 16 wedges. Place 1 teaspoonful of filling across wide end of each wedge. Starting at wide end, roll toward the point. Place cookies point side down on ungreased cookie sheet lined with parchment or a silicone baking mat. Brush with melted butter and sprinkle generously with cinnamon sugar mixture. Repeat with remaining two dough balls and filling. Bake 22 minutes. When cool enough to handle cookies, remove from cookie sheet, dip bottoms in granulated sugar and place on wax paper to cool completely. Make the dough and filling a day ahead of time and refrigerate. The dough will firm up; the filling ingredients will meld and the sugar will dissolve. Roll out the dough on a floured silicone mat if you have one. That will help make the very-sticky dough easier to handle. Be precise: Roll out a circle of dough to exactly 12 inches in diameter, and cut it into 16 wedges. This makes for more uniform, pretty cookies. Dip your knife in flour before you cut the rolled-out dough into wedges, so it doesn’t stick. Put the filling right at the wide edge of the triangle so it’s less likely to spill out of the cookie. Don’t overfill. 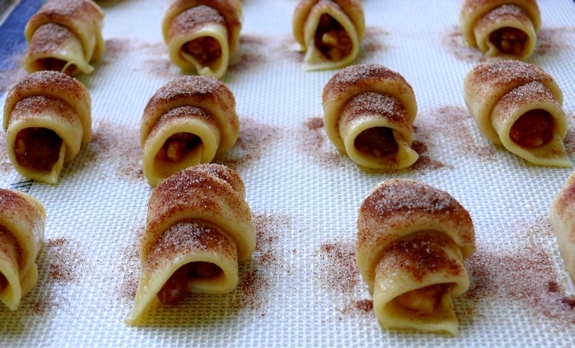 Be generous with cinnamon sugar, which gives the rugelach a lovely sandy surface. Bake for exactly 22 minutes on a cookie sheet lined with baking parchment or a silicone mat, to catch drips and spills that can burn. When cool enough to handle, dip the cookie bottoms in granulated sugar so they won’t stick to your cookie tin or wax paper. i enjoy baking rugelach. thus far my fav is chocolate but, this recipe looks great! thanks for this lovely recipe & all the fabulous tips. wishing you & your family a wonderful new year! Those look so yummy. I bet you could do the same filling with crescent roll dough and get the same flavors. However, not the consistency of that delicious looking crust. Oh my this recipe sounds amazing, wow. I love the filling! Wow, I have been looking for a good recipe for a long time…this sounds like the one!! I am not so good at rolling out dough but I am going to try! This is my kind of dessert! Little puffs of yum! I LOVE rugelach! Although, I prefer a chocolate filling or cinnamon sugar without the nuts. I love Rugelach! This looks like a great recipe for them. I bet you are glad that you have made them now.It can now start to be part of your sons memories. I adore rugelach! I’ve never made my own even though I’ve seen recipes (including this one) that make it seem so easy! Maybe next Christmas! Happy Holidays to you and yours Cathy! 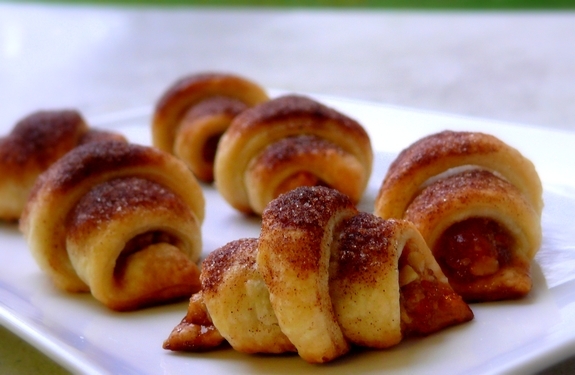 I haven’t made Rugelach in years…but this has inspired me to make a batch. Maybe this weekend. THEN…the after holiday diet will begin! That is a great recipe. Definitely a keeper. 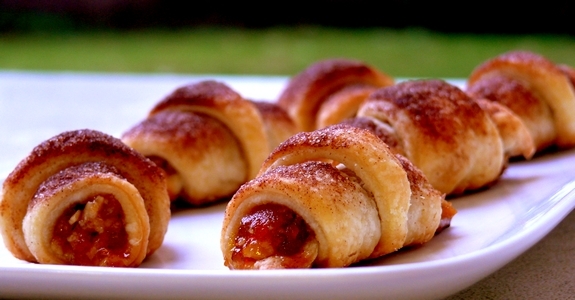 yum, i love rugelach. especially the chocolate + cinnamon variety. these look so good! This just piqued my non-existent sweet tooth. Beautiful photos and a very tasty sounding recipe. For a chocolate version I have used a similar dough with nutella in the center. They are amazing! Your dough would work perfect. These look yummy! And fairly easy to make…might be found in my kitchen soon! Oh, and the wine was delish! Happy New Year! Wow — they look perfect. First attempt too. Very impressive.